A sailor from the South Korean naval unit dispatched to the Gulf of Aden on an anti-piracy mission was found dead in Oman's southern port city of Salalah, the defense ministry said Wednesday. The 27-year-old petty officer first class, only known by his family name Park, was found lying on the floor of a local swimming pool in Salalah on Tuesday afternoon (local time). He was pronounced dead on arrival to a local hospital, a ministry official said in a briefing. "The military will form an investigation committee to find out what caused the death," he said. 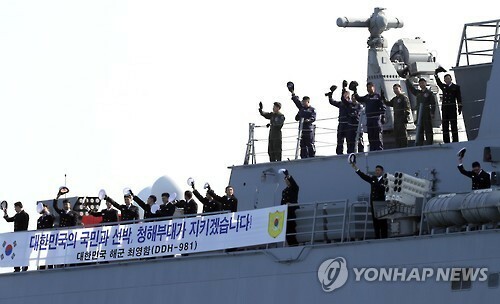 South Korea has deployed the Cheonghae Unit aboard a 4,500-ton destroyer in the Gulf of Aden since 2009 as part of global efforts to combat piracy off the coast of Somalia. The unit is composed of about 320 troops, including Navy SEALs, Marines and Navy pilots, to protect South Korean vessels off the Somali coast and provide support to ships of other nations in nearby waters.